By Dr. James Gels, from the Coach’s Clipboard Basketball Playbook, original article edited and expanded by Adam Eyal. As one of the most popular sports in the world - some experts say it currently ranks second to football globally - basketball is played in various countries, at various expertise levels and on different courts. Of course backyard basketball court dimensions will be different from what you'll find at a college or on national level. Perhaps you need to upgrade your current court. Below we'll show you the exact basketball court dimensions for different applications. On a US court your basketball court, length dimensions in feet should be 84. However, it can differ slightly, but if less than 74' the markings will differ slightly from the image: Divide it by two lines positioned 40' from the furthest end line. The court's width should optimally be 50' feet wide. The center circle and free throw lines have radiuses of 6' feet. The distance from the hoop to the 3-point line must be 19'9" feet to the front and sides. Lane space and Neutral zone marks must contrast with your lane boundary lines. Lines must be 2" wide, except for neutral zone markings. End lines can be up to 3" wide. Ideally you want 10' of space around the court, where no obstructions should be placed. If you have limited space, at the very least, create a 3' gap between the outside lines and any obstructions or people. If you need coaching boxes, regulations for their positioning can be found in the rule section. In international games the regulations change slightly from a USA court and even differ slightly from NBA basketball court dimensions. Courtesy of Cykelvalg.dk... see more of their diagrams at http://www.cykelvalg.dk/baner/. 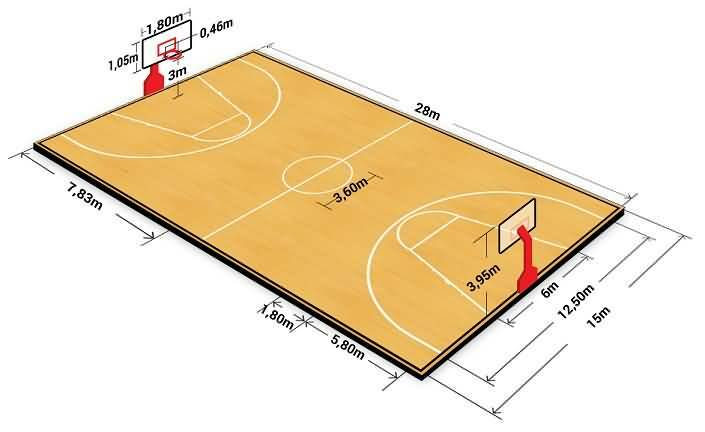 For FIBA (International Basketball Federation) the court measures 91' (28m) long and 49' (15m) wide. The distance from the hoop to the three point line must be 19.7' (6m). From the back of the court to the center circle there's a distance of 25.68' (7.83m). The free throw line is (5.8m) 19' from the back of the court. The lines running from the free throw line to the back of the court meet the edge of the court 19.68' (6m) apart. Note that with half court basketball dimensions only the length dimensions are cut in half, not the details relating to the width. This should help you set up your professional court to resemble the courts the pros play on. If you have practical tips to help others find quick ways to upgrade their courts, please share your experience with us in the comments.